Marichka: Will we be together? 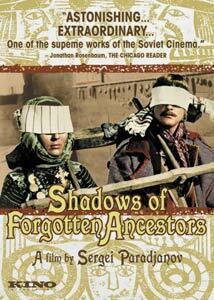 Sergei Paradjanov made films that were decidely unpopular with the Soviet authories under whom he worked; his first major critical success, 1964's Shadows of Forgotten Ancestors, eschewed the social realism that the Soviet government wanted filmmakers to adhere to. His refusal to stick to the party line eventually saw him imprisoned for a few years and banned from making films for several more. Thankfully, his work has survived, and Kino is now bringing out a new collection of his films, including Shadows, newly restored by the Russian Cinema Council, aka Ruscico. Shadows remains just as wildly rebellious as it must have forty-plus years ago, a striking film that refuses to play along by rules of traditional cinema. The plot is quite simple: Ivan (Ivan Mikolajchuk) is a peasant whose father is killed after a brief skirmish with another man. That man's daughter is Marichka (Larisa Kadochnikova), and the two children form a close friendship that develops over the years into love. Their future together would look rosy, but an accident leaves Marichka dead and Ivan distraught. He marries another, but little will deter him from thoughts of his dead beloved. Shadows isn't the sort of film to take a blind stab at, especially if your tastes don't already run to art cinema in general. The 'story' is minimal, with the film operating more as a visual poem than any kind of narrative, though there is a story there. I have to admit to being largely baffled by some of the goings-on in the film, which stems in part from total unfamiliarity with this part of the world and the people who inhabited it. The customs and practices are alien, but remain fascinating thanks to Paradjanov's forceful direction and eye for striking compositions. This is a film that will dazzle the eye even the brain doesn't always process what is actually happening. As a consequence, it's hard to adequately judge the acting, which features post-dubbed dialogue, but Mikolajchuk proves suitably morose as the haunted Ivan. The use of indigenous music and folk elements leave the film miles away from anything else of the era in terms of Soviet filmmaking and of just about anywhere else for that matter. This is filmmaking of the highest order, and should be seen by anyone who wants to experience pure cinema. Image Transfer Review: Presented in a restored edition ported over from a previous PAL release by Ruscico, those who eschew such Kino releases will probably do so on principle, but to my eyes this looks perfectly fine while playing. The film is presented in its original 1.33:1 ratio. Audio Transfer Review: Three options are present, the primary one the original mono Ukrainian track (though the jacket copy makes no mention of it). This sounded quite clean, with very little hiss or breakup, working well within its inherent limitations. Also on hand are 5.1 Ukrainian and Russian tracks, which I did not sample. Extras Review: Two main extras; the first is Andrei Tarkovsky and Sergei Paradjanov—Islands (38m:56s), which looks at the friendship between the two filmmakers, as the former served as a huge inspiration to the latter. A good deal of interview and vintage footage is included. Also here is Songs (8m:23s), a short film about religion that features a dedication to Paradjanov. Stills galleries and a brief trailers collection wrap things up. For the adventurous cinema fan, Paradjanov is a must; his films take us to places we otherwise would never see, and do in vigorous fashion. Kino's port of a previous Ruscico release looks fine, with a pleasing enough image and sound, in addition to some interesting extras.